HOLLYWOOD BASED SPY RING (1980s) = DELIVERED USA SECURITY AND NATIONAL SECRETS + TECHNOLOGY + MATERIALS FOR MAKING ISRAEL TO MAKE NUCLEAR BOMBS = 400 ILLEGAL NUKES IN ISRAEL NOW | Concise Politics -- Your Time should NOT be wasted. 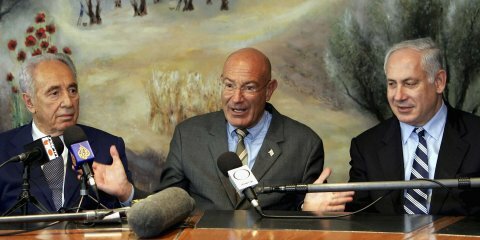 Israeli-American movie producer Arnon Milchan confirmed he served as an Israeli spy for decades while working in Hollywood with Israel’s secretive KEY OPERATIVE for LAKAM economic espionage unit. MILCHAN = CRIMINAL SPY = Recruited in the 1960s = He operated 30 companies in 17 different countries. MILCHAN = Helped Pollard infiltrated a U.S. company to obtain tons of highly-enriched uranium. MILCHAN = Helped Israel obtain key nuclear equipment and information while Peres established the Dimona nuclear reactor as Director-General of the Ministry of Defense. MILCHAN = Company, Heli Trading Co., brokered the shipment of 800 krytons — sophisticated triggers for nuclear weapons — from the California company MILCO International Inc. to the Israeli Ministry of Defense between 1979 and 1983. 1985 U.S. indicted and extradited MILCO President Kelly Smyth on 30 counts of smuggling and making false statements. Smyth told FBI agents in LA = Smyth was recruitment by Milchan and Netanyahu who worked at NUKE smugglers at Milchan’s Heli Trading Company in Israel. “Project Pinto” NUKE smuggling operation was TERMINATED after Smyth’s arrest for smuggling 800 nuclear triggers and subsequent flight from the U.S.
MILCHAN = of course, denies he knew about the nuclear triggers, but it’s clear that he was integral to Israel’s nuclear program. This entry was posted in HOLLYWOOD BASED SPY RING (1980s) = DELIVERED USA SECURITY AND NATIONAL SECRETS + TECHNOLOGY + MATERIALS FOR MAKING ISRAEL TO MAKE NUCLEAR BOMBS = 400 ILLEGAL NUKES IN ISRAEL NOW and tagged HOLLYWOOD BASED SPY RING (1980s) = DELIVERED USA SECURITY AND NATIONAL SECRETS + TECHNOLOGY + MATERIALS FOR MAKING ISRAEL TO MAKE NUCLEAR BOMBS = 400 ILLEGAL NUKES IN ISRAEL NOW. Bookmark the permalink.